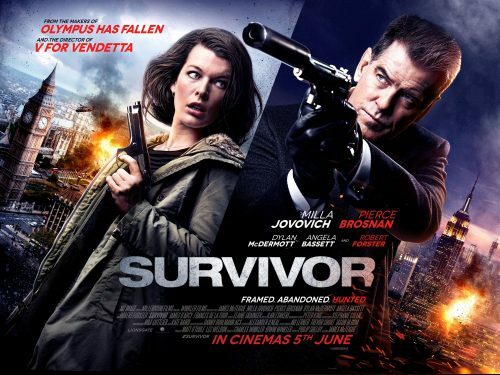 The poster for the upcoming Milla Jovovich & Pierce Brosnan thriller, Survivor, has arrived. It’s been quite a while since the trailer hit the blog. The poster has so many clichés of not only film but of the genre as well! The use of red/orange and blue colours. Day and night. Showing the “light” of good and the “dark” of evil. Look at the names on the poster. Who is in which colour? Does that mean that Robert Forster’s character is on the dark side? At least it doesn’t involve the Russian Mafia Gangsters. Well, it isn’t mentioned in the below synopsis! “Survivor” is a thriller about a State Department employee newly posted to the American embassy in London, where she is charged with stopping terrorists from getting into the U.S. And that puts her in the line of fire: targeted for death, framed for crimes she didn’t commit, discredited and on the run. Now she must find a way to clear her name and stop a large-scale terrorist attack set for New Year’s Eve in New York’s Times Square.